Do You Feel Unusually Tired—Yet Wired? One of the most compelling stories I’ve come across recently is about the brain and how it works, and how the daily practice of mindfulness and being mindful can really change things for the better—in the workplace and beyond. How it can improve learning, decision-making, concentration, performance and productivity, reduce sickness and absenteeism, and stimulate innovation and creativity. And how it can make you more resilient, compassionate and dramatically improve relationships. Not so long ago, I also chanced upon the term ‘Information Overload’ and read about the deleterious impact this can have on how people learn, or rather find themselves unable to learn! The Brain is without question a wonderful thing, but the simple truth is it’s being over-stimulated by the modern world — A volatile, uncertain, complex and ambiguous world. I believe we live in an age of ‘Great Acceleration’, with Big Data, Globalization, and advances in new technology and Artificial Intelligence all conspiring to up the ante and radically recast how we work and indeed how we play! So what are the consequences? 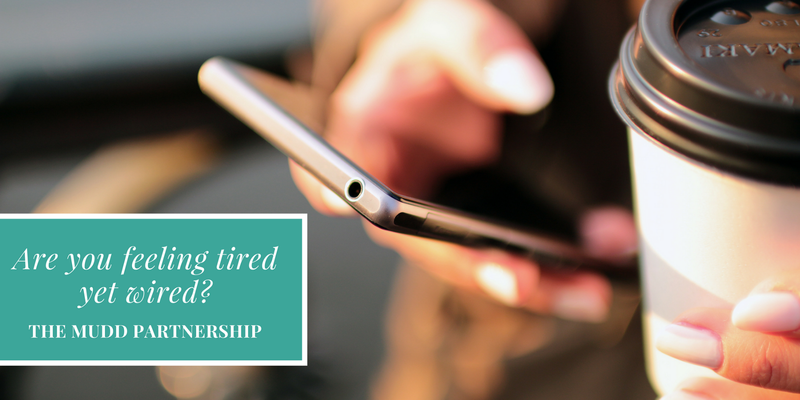 Well, 1-in-5 people are reporting feeling unusually tired, yet wired at the same time? And they’re waking up wondering whether they’ve slept at all because of the buzz of a constant narrative that’s been running through their head! Perhaps you recognise and share these symptoms? May be you’re one of those suffering from a growing epidemic of tiredness; although it’s not really the kind of tiredness which is caused just by a lack if sleep. As well as a personal cost of course, there is also a business cost and one recent large-scale survey of 38,700 British employees revealed that only 15% felt revived by their sleep, &, even the Royal College of Psychiatrists believes that 1-in-5 of us is ‘unusually tired’ at any given time. It would seem that many of us are suffering from the negative effects of being on the merry go-round of modern life. So, do we stop & get off? And if Yes, How? Well whilst this sense of fatigue is pretty universal it would appear, clinically it is being suggested that in many cases there is no underlying medical condition, or indeed anything wrong, &, it’s not really about sleep at all — it’s actually about a ‘State of Mind’. In my new book, “Uncovering Mindfulness: In Search Of A Life More Meaningful” & now available on Amazon I take a close look at the very positive impact that Mindful practice can have on both our personal and professional lives. To practice Mindfulness means to practice being aware; connecting the physical with the mental and being conscious of what is going on inside your mind and in your body, whilst simultaneously being very aware of the world around you. The mere act of living requires a considered degree of mental clarity and focus, yet there is a very real imperative and tension to be constantly in a ‘doing mode’ — updating your status on your smart phone & answering emails at 10PM, for instance. The experts will tell you that if someone is suffering an overload of information they may get ‘stuck’ in the intermediate levels of sleep when the Brain is consolidating and filing, but never reach as far as the deeper rejuvenating ‘Delta’ sleep, which is very probably why we wake up feeling so tired! The most vital and important thing we can do is to give our Brains a break from this ‘Information Onslaught’ and research shows that Meditation and the practice of Mindfulness techniques can help us feel more rested. For some however, Meditation or the practice of Mindfulness might feel like a stage to far, whatever the science may say. But it isn’t waving Angel Cards and it isn’t New Age and it’s not about learning to be nice to people, or saying hello to your dishes before you wash them. The science is persuasive and suggests that simply by consciously trying to spend 10 minutes each day ‘In the Present’ and noticing the world around you can make a very real difference. It can enable the Brain to move from a switched-on ‘Beta’ state to a slower and more relaxed ‘Alpha’ state, &, beyond this lies the ‘Theta’ state where essentially your Brain goes ‘offline’ (think ‘Day Dreams’) & it is in this state that your creativity increases. It’s also the state that builds resilience and mental acuity and stamina. Another reason to act smart and look after the Brain though is to counter the effects of what is euphemistically referred to as a ‘Senior Moment’, &, this is becoming of increasing importance as the population ages. Whether ‘Information Overload’ or not, as we advance in years we all have these unbidden episodes; those minor absences — forgetting where we left the keys, or the name of a favourite Band; or little lapses in mental focus which can have a detrimental impact on our professional, social and personal well being. Neuroscience is a really fascinating field of research and as Neuroscientists discover more and more about the Brain and how it works, they are increasingly finding out that there’s actually rather a lot that can be done! My new book devotes an entire chapter to this and there really is a clear scientific case as to how and why Mindfulness works! Put simply, in order for the Brain to make neural connections and new neural pathways, it needs exercise much in the same way as the rest of the body. Mental workouts can significantly improve cognitive functions, strengthen neural pathways and increase your mental sharpness and acuity. But as you can’t get fab abs with only one sit-up, you need to apply yourself. So, a little Mindfulness training, as well as keeping on doing the daily Cross Word puzzle or Sudoku solving, may very well be all you need to re-balance, reboot and reassert your mental edge?